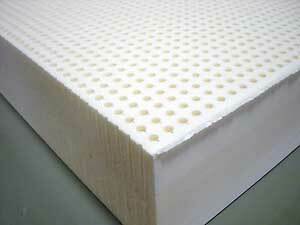 1.75" Latex Foam Topper. Latex Mattresses dynamically conform to your body with a firmer feel than memory foam to support different areas of the body. Latex is made from a rubber tree. When the bark of the tree is cut, a milky liquid exudes and is subsequently whipped and baked. Latex foam mattresses are hypoallergenic because of their natural resistance, making it hard for bugs to create a habitat in which to survive. Never needs to be rotated or turned over because this type of foam will not sag like most innersprings.